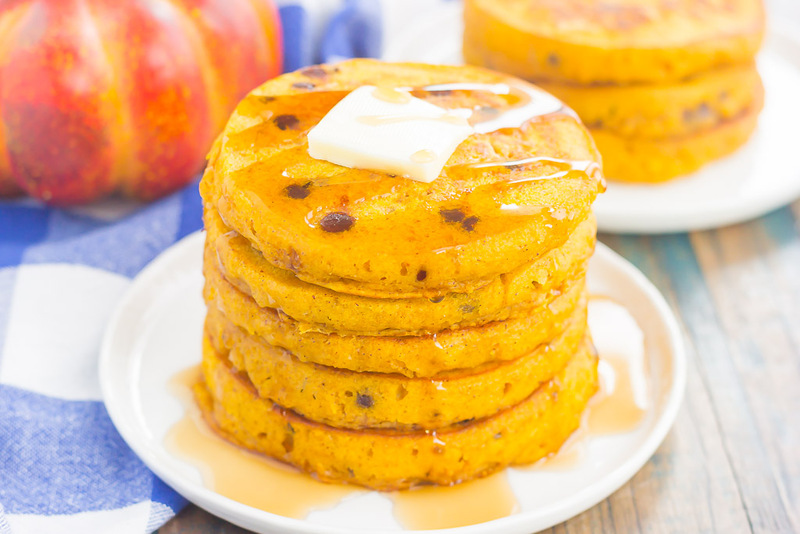 These Pumpkin Chocolate Chip Pancakes make a deliciously cozy breakfast for fall. Filled with sweet pumpkin and bursting with chocolate chips, these simple pancakes are soft, fluffy and so easy to make! Breakfast for dinner is a favorite of mine. Eggs and bacon, or pancakes and waffles just seem to taste a little bit better when it’s eaten for dinner once in a while. Don’t get me wrong, I love breakfast, and if you’ve been hanging around here long enough, it’s my favorite meal to go out for. But, when I have it for dinner, you can bet that I try my hardest to make it extra special. You know, make that bacon extra crispy, make those pancakes extra large and fluffy, or put a new spin on a scrambled eggs. The hubster and I always plan our dinners for the week, and when we get stuck on what to have, breakfast for dinner always comes to the rescue. It’s usually a fast and easy meal but is hearty and holds you over. My kind of dinner! And since fall is now upon us (hooray for pumpkin everything, officially! ), I knew just what my next ‘breakfast for dinner’ idea was going to be. Pancakes! But, not just any pancakes, friends. 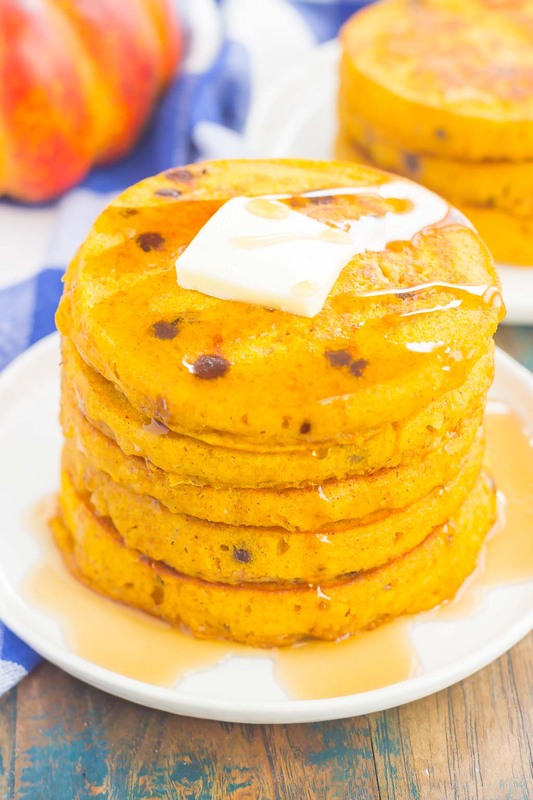 Pancakes for breakfast is always a winner in my book, but when pumpkin is involved, even better! And the hubster, who’s not the biggest fan of pumpkin anything, loved these pancakes. 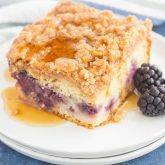 So that means that these are extra delicious and a must-make for you! Like most of my recipes, these Pumpkin Chocolate Chip Pancakes are a breeze to whip up. 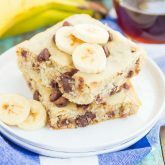 With the help of Krusteaz Chocolate Chip Pancake mix, you can be sure that these pancakes will be filled with flavor and bake up soft and fluffy. 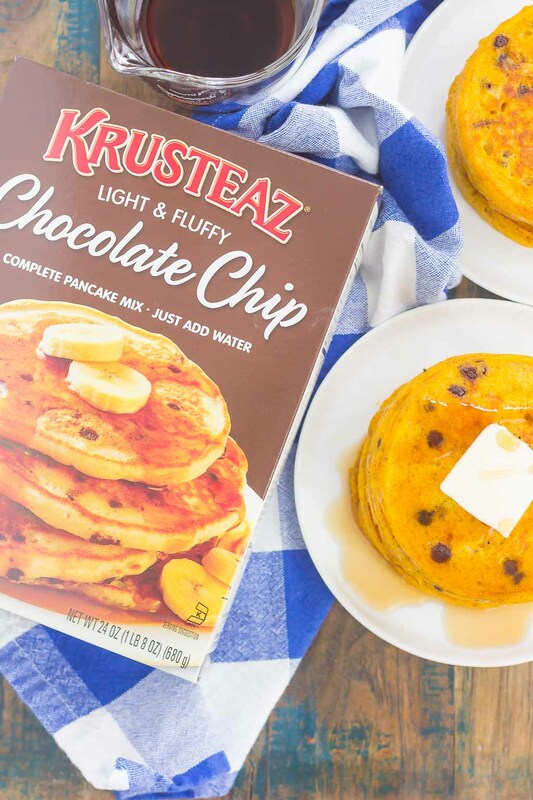 Krusteaz is my go-to brand of choice for easy cookies, cakes, and now pancakes. And what goes better with a little chocolate than some pumpkin? 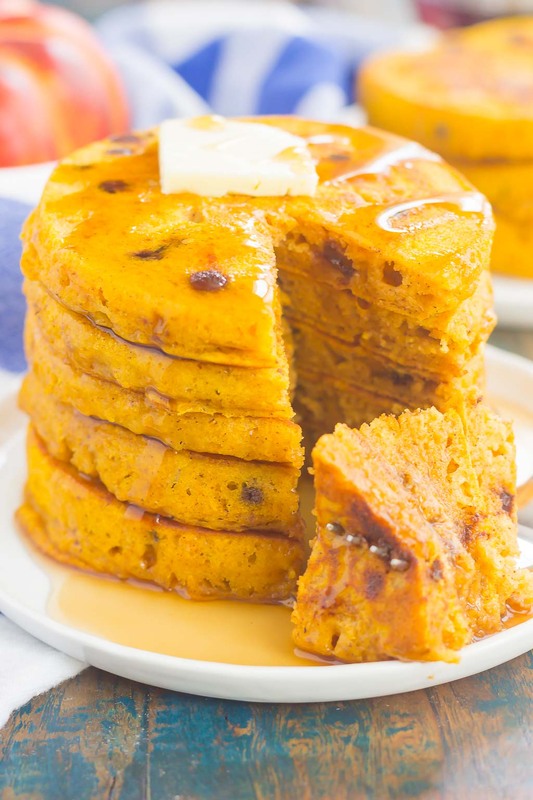 Even if you’re not a big fan of pumpkin (like the hubster), I guarantee you’ll love it in these Pumpkin Chocolate Chip Pancakes. It gives this dish an extra hint of flavor, without being too overpowering. After all, it’s fall around here and I’m trying to soak up all of the pumpkin-y goodness while I can! 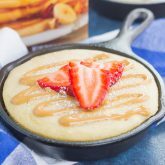 There’s nothing better than the first bite of a soft and fluffy pancake, slathered with some butter and drizzled with a little maple syrup. Am I right? It just tastes all warm and cozy, perfect to enjoy on a cool fall morning, or in this case, night! 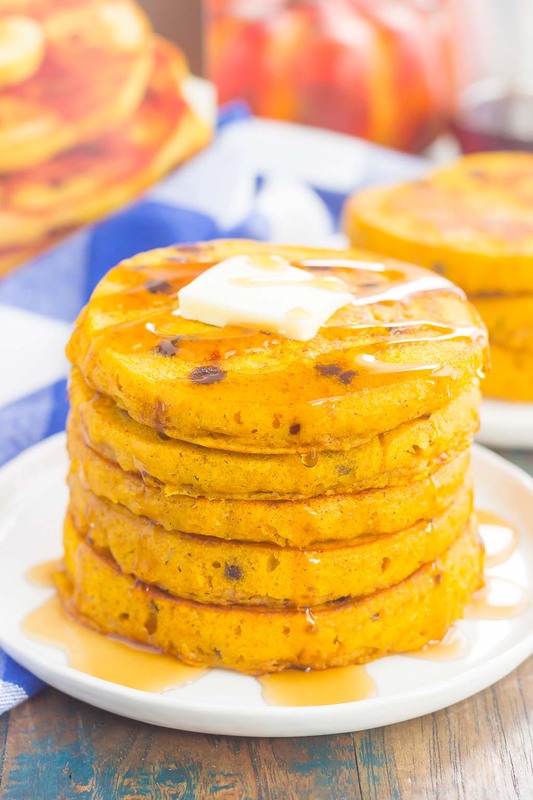 So, if you’re in the mood for breakfast for dinner, get your pancake flipper ready and whip up these oh-so delicious Pumpkin Chocolate Chip Pancakes! Preheat electric griddle or heat a regular griddle over medium heat. In a medium bowl, add pancake mix and water. Stir until just combined. Add pumpkin and pumpkin pie spice to mix, stirring until combined. Add butter to heated griddle and pour slightly less than 1/4 cup of pancake mix onto griddle to form a pancake. Cook pancake for 2-3 minutes per side, or until tops begin to bubble, flipping only once to ensure those fluffy pancakes. Repeat with remaining batter. I get excited about eating breakfast for dinner...there's just something so fun about it! Pumpkin and chocolate is one of my favorite fall combinations and these pancakes really do look amazingly fluffy! 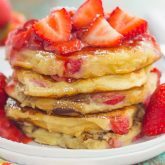 I often eat breakfast for dinner and love it :) These pancakes look so fluffy and delicious! Oh these pancakes look so good!!! Thanks for the sweet comment and for stopping by, Sheenam! Pancakes look yummy. Where can I buy pancake mix? I live in NYC. Hi Diana! You can find Krusteaz at your local grocery store, Target, Walmart, etc..should be in the baking aisle or by the other pancake mixes. Enjoy!